Social Security benefits have lost 34 percent of buying power since 2000, according to the 2018 Social Security Loss of Buying Power Study released today by The Senior Citizens League. “When costs climb more rapidly than benefits, retirees must spend down retirement savings more quickly than expected, and those without savings or other retirement income are either going into debt, or going without,” Johnson says. Social Security benefits have lost 34 percent of buying power since 2000, according to the 2018 Social Security Loss of Buying Power Study released today by The Senior Citizens League. “This is the biggest loss of buying power recorded since 2012, and that was the biggest loss that The Senior Citizens League’s study has recorded to date,” says study author Mary Johnson, a Social Security policy analyst for the League. The findings represent a significant one-year loss of 4 percent in buying power, with the loss growing from 30% to 34% from January 2017 to January 2018. The loss occurred even though beneficiaries received a 2 percent annual cost - of - living adjustment (COLA) for 2018,” says Johnson. Housing and medical costs — particularly home heating expenses and Medigap premiums — were among the most rapidly - rising costs over the past year. The study examines the growth since 2000 in price of goods and services that are typical for retired and disabled households, and compares that to the growth in Social Security benefits due to annual COLAs. Based on consumer price index (CPI) data through May of this year, Johnson estimates that the COLA for 2019 will be about 3.3 percent, the highest since 2012. That number could change since there are still four months of data to be collected before the Social Security Administration announces the COLA. More than 1,057 respondents participated in The Senior Citizens League’s annual senior survey, which was conducted from January through March of this year. Participants confirmed that monthly household expenses made steep increases over the past year, far in excess of the dollar amount that their COLAs increased benefits. More than half, 56 percent, indicated their monthly expenses went up by more than $79. Yet 50 percent of survey respondents said that their COLA increased benefits less than $5 per month, after the increased Part B premium for 2018 was deducted from their Social Security benefits. Social Security beneficiaries receive a small automatic increase in their Social Security checks most years, intended to help their benefits keep up with rising costs. 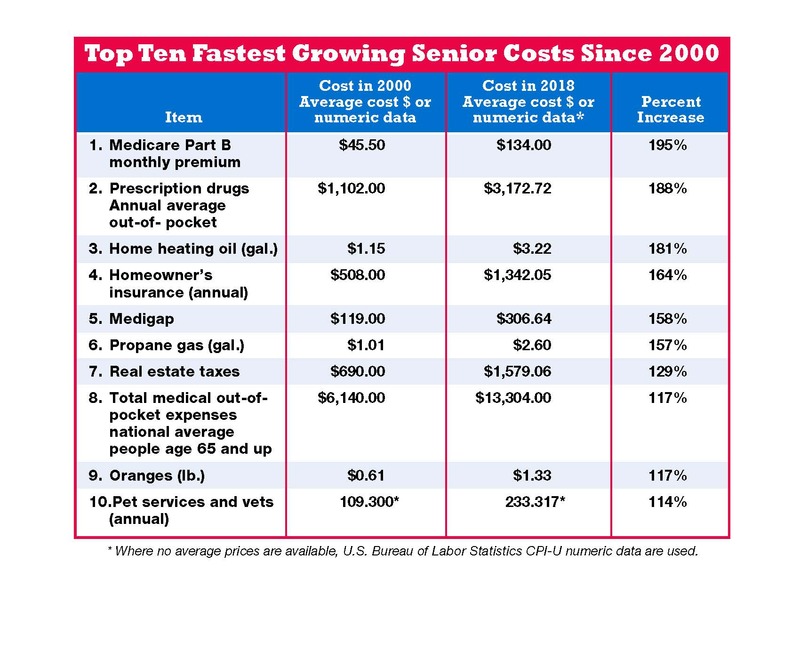 But since 2000, COLAs increased benefits a total of just 46 percent, while typical senior expenses have jumped 96.3 percent. “When costs climb more rapidly than benefits, retirees must spend down retirement savings more quickly than expected, and those without savings or other retirement income are either going into debt, or going without,” Johnson says. The survey found that a person receiving the national average Social Security benefit in 2000 — $816 per month — would have $1,193.10 per month by 2018. However, because retiree costs are rising at a substantially faster pace than the COLA, that individual would require a Social Security benefit of $410.30 more per month, or $1,603.40 in 2018, just to maintain his or her 2000 level of buying power. The study examined the increase in costs of 39 key items between 2000 and January 2018. The items were chosen because they are typical of the costs of most Social Security recipients, and include expenditures like Medicare Part B premium, that are not measured by the index currently used to calculate the COLA. Of the 39 items analyzed, 26 exceeded the percentage of increase in the COLA over the same period. “This study illustrates why Congress should enact legislation to provide a more fair and adequate COLA,” Johnson says. “To put it in perspective, for every $100 worth of groceries a retiree household could afford in 2000, they can only buy $66 worth today,” Johnson adds. A majority of the 59 million senior and disabled Americans who receive Social Security depend on it for at least 50 percent of their total income, and one–third of all beneficiaries rely on it for 90 percent or more of their income. To help protect the buying power of benefits, TSCL supports legislation that would base COLAs on the Consumer Price Index for the Elderly (CPI-E). To learn more, visit http://www.SeniorsLeague.org.